Registration closes on May 2nd at midnight. Registration and packet pickup wil be at Connellsville Boat Ramp May 3rd at 4pm-7pm. There is a spaghetti dinner for $8 at registartion Friday night. Race starts at 10am. The start is chip timed and you will have until 10:30 to cross the matt to begin the race. 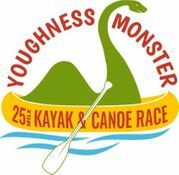 May 4th 2019 The Youghness Monster 25 is a 25 mile canoe & kayak race from Connellesville - West Newton, PA on the Youghiogheny River. The Town of Connellsville Welcome Paddlers Party and Packet Pickup. There will be a packet pickup, music and food. Great time to socialize and get more info on the race. The kayak race will start at the Connellsville Launch ramp. 310 N 3rd St. Connellsville. No.1 PFD's must be worn at all times during the race. No. 4 Sounding device (whistle) with each PFD. All PA Fish & Boat regulations apply. No. 5 with the water temperatures we recommend minimum a wetsuit for for the race. There is a lot of Fire dept rescue boats throughout the course. The race is on a very scenic section of the Youghiogheny River that is class 1 & 2. There are some fun rapids. At the perfect water level that we expect this time of the year you can use any type of canoe or kayak. There will be kayak & canoe classes. Tandem Racing Canoe pro boats, cruisers, etc.